I was looking for a “tasty utilitarian something.” Something that could work for breakfast/brunch, or as an appetizer during cocktails, or as a first course in a fancy-shmancy dinner. I picked up this recipe for Muffin-tin Mini Quiches from Eating Well and while it lacks a pie crust, it doesn’t lack flavor. And it certainly comes in ideal serving portions for use in all of the serving opportunities noted above. Further, you can make it ahead of time (like I did). 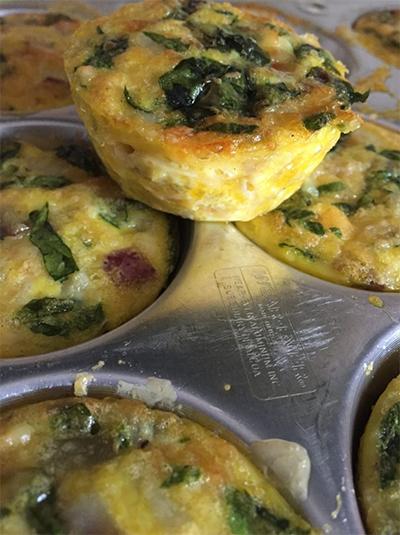 After the quiches have cooled and removed from the muffin tin, wrap the quiches individually in plastic and refrigerate for up to 3 days (or freeze for up to 1 month). To reheat from fridge, remove plastic, wrap in paper towel and microwave on high for 30 to 60 seconds. Tonight the quiches will be served before our standing rib roast. My “go-to” white is Sauvignon Blanc. And for tonight I’ve selected a wine from New Zealand. Loire Valley would also have been a good choice… Sancerre, Pouilly Fumé and Quincy all produce excellent Sauvingon Blancs. Other Loire whites would be great choices, too: Muscadet or Dry Vouvray. Pinot Gris from Alsace or Pinot Blanc from the Alto-Adige are other wines that I love both as aperitifs and to go with the quiches. A brilliant, pale straw green colour. This is a ripe style of Sauvignon showing elements of passion fruit, mango, melon and stone fruit, as well as subtle yoghurty complexity from a whisker of barrel fermentation. The palate if soft, full and dry taking richness from the excellent fruit weight achieved in the vineyard. Classic Marlborough Sauvignon flavours of tropical fruits and underlaid by a vein of exotic fruits reminiscent of guava and lychee. The extract of the wine fills the mouth while acidity keeps the palate alive through to a clean, dry finish. Preheat oven to 325°F. Coat a 12-cup muffin tin with cooking spray. Heat oil in a large skillet over medium heat. Add potatoes, onion and ¼ tsp salt and cook, stirring ’til the potatoes are just cooked through, about 5 minutes. Remove from heat and let cool 5 minutes. Whisk eggs, cheese, milk, pepper, ½ tsp of salt in a large bowl. Stir in spinach and the potato mixture. Divide quiche mixture among the prepared muffin cups. Bake until firm to the touch, about 25 minutes. Let stand 5 minutes before removing from the tin. n.b. The smoked gruyere fills in a layer of flavor that could accomplished with diced bacon or ham. And next go ’round I might add ham anyway!